The British summer is not always sunshine and blue skies, and there are bound to be days over the long school holidays when you're cooped up inside with your kids waiting for the weather to break. How do you keep unruly kids entertained and stop them from pressing their noses up against the window while it pours down outside? If you have a Samsung GALAXY S4 there are plenty of apps that can turn a bout of bad weather into a fun afternoon. Games, colouring books, virtual pets and even a pocket-sized sandbox – plus all the apps you need to make sure they don't delete your contacts or stumble across something unsavoury online. Here are our picks of the best apps to save a rainy day and turn those frowns upside down. Using Comic Strip It! Pro, you and your kids can build a comic strip from your photos, complete with panels, speech bubbles and 'sound effect' captions. Turn some old holiday photos into a pirate adventure or take some new snaps of their favourite toys with the GALAXY S4's camera, then make up a story to go with them. 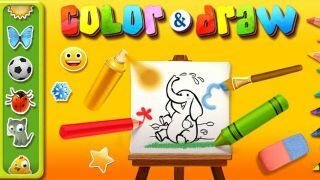 The app is very simple to use and no drawing skills are required. Minecraft is the ultimate 'sandbox' game. A free-roaming world to explore and plunder of natural resources that you can use to craft tools and weapons in order to survive. The game can be played in 'Survival' mode which features monsters and natural hazards to battle against – this is fun but can be a bit scary for younger children, despite the chunky retro-style graphics. There is also the entertaining 'Creative' mode which gives you and your kids free rein to build whatever fantastic structures you want and then explore them. It's creative, educational and tremendous fun for all ages. Talking of sandboxes, Sand! is a curious app that is more of a toy than a game, but one that both you and your kids could easily sink hours into. The app simulates the physical properties of some real-world materials such as particles (grains of sand, salt or gunpowder), water and fire. You can draw some sand on the screen and it will 'fall' downwards due to artificial gravity. If you draw some rock underneath it, the sand will collect in a pile. You can add water, grass, fire and many other substances and just… play. A very silly app that is a great way to keep a small child amused. Tom is an anthropomorphic kitty who lives in your GALAXY S4. You can poke and prod him to get different reactions and hit different buttons and objects on screen to activate different actions and responses. Sometimes his naughty dog pal Ben will pop out and give him a scare with hilarious consequences. The built-in actions are fairly limited but funny and well animated, and Tom's best trick is that he will repeat anything you or your child says to him in his mewling catty voice. Endless fun for little ones. iStoryBooks turns your GALAXY S4 into a portable library of colour picture books, many of which have voice tracks, with the iStorybook magically 'reading' itself to your child. Titles range from folklore and fairy tales to science, nature and history. The free app comes with a big library of titles (new books are added every two weeks) or you can pay a 99p monthly subscription for more.